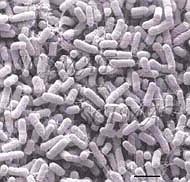 Salmonella is a genus of rod-shaped Gram-negative enterobacteria that causes typhoid fever, paratyphoid fever, and foodborne illness. Salmonella typhimurium and Salmonella enteritidis are serovars of Salmonella enterica. 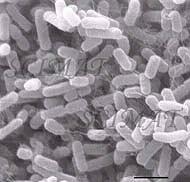 This group also includes Salmonella typhi (not shown above). Salmonella may contaminate poultry, eggs, unprocessed milk, meat, and water, to name a few sources. These bacteria may also be carried by pets like turtles and birds. This latter website provides advice on the symptoms of salmonella poisoning and also on situations when it is advisable to visit a physician. People should always wash their hands immediately after handling a reptile, even if the reptile is healthy. Washing of hands is one of efficient ways how to prevent not only salmonellosis but all other foodborne ilnesses as well. 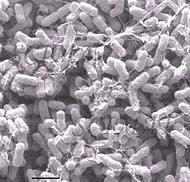 Salmonella enterica serotype "Heidelberg" (S. heidelberg) is a group B Salmonella which apparently accounts for a small proportion of cases of disease in humans. Between 1994 and 1997, this bacterium was the tenth most frequently identified serotype isolated from humans in Italy (1.3% of all human isolates). 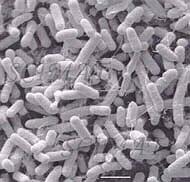 Salmonella hadar is an emerging foodborne gastroenteritis pathogen in Europe. Over 2000 cases in Spain were associated with consumption of pre-cooked chickens. The scanning electron microscopy images shown above were obtained by the author. Bacterial cultures provided by Dr. J. R. Chambers.